On June 29th, 2017, the iPhone turned ten, marking the anniversary of a cultural shift in communication and accessibility of information. In a study conducted by Pew Research, 46% of smartphone owners claimed “they couldn’t live without” their smartphone. Technology is designed to be addictive, and with the internet, texting, and social media, there’s instant gratification to any desire—including getting a response from someone within minutes. As a result of immediate means of communication, many of us expect constant real-time communication with not only friends and family, but with businesses as well. We’ve gotten addicted to the attention. As customers, we expect the best and won’t stick around if we feel undervalued. These days consumers are influenced by social trends and empowered by technology, and are more knowledgeable, less patient, and more demanding. Not only are we in the experience economy, where a customer’s experience with your brand is as valuable as the product, we’re also in the expectation economy. If we experience one brand’s gold standard of service, we expect every brand we interact with to offer the same personalized, immediate, and seamless experience. Expectations for better consumer experiences are on the rise and if your brand can’t keep up with the expectation economy, customers aren’t afraid to buy from a business that treats them better. 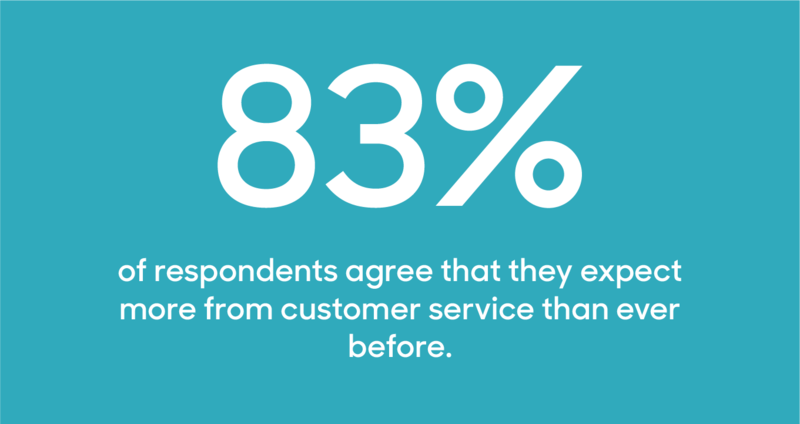 In a recent survey conducted by Loudhouse and commissioned by Zendesk, a sizeable 83% of respondents agree that they expect more from customer service than ever before. With an increasing expectation for real-time communication, live chat and messaging are crucial channels for customer service excellence. Over the last five years, the number of U.S. online shoppers who use live chat increased from 38% to 58%. Over 2.5 billion consumers use messaging apps, and according to a 2016 Nielsen study, 56 percent of of Facebook Messenger users would rather message a business than call. Some websites handle thousands of customers requests on a daily basis, and the increased demand of a live channel can stretch support teams. So what do you do when the chats start flooding in? Customers want to be able to reach your brand at any time in real-time, but they also expect a high-quality support interaction. Whether you’re a rapidly growing company or a well-established global enterprise, as chats come in, it can be difficult to scale to the number of interactions. In order to open lines of communication and still offer quality support, brands need a product that can offer live support on websites, mobile apps, and through messaging services—at scale. That’s where Zendesk Chat and Message come in. Zendesk Chat is a live chat product that allows you to respond to multiple customers at once and to reach out proactively in real-time, no matter where your customers happen to be. You can add Chat on your website, or natively within your mobile app, and offer customers personalized support even as your business grows. Consumers also spend a lot of time in messaging apps like Facebook Messenger, Twitter Direct Messages, and LINE. Zendesk Message lets you connect messaging services into one dashboard, allowing you to manage social interactions at scale. With a single view of conversations across various messaging apps, your support team can easily juggle multiple interactions at once. Communicating via messaging apps is a personal and intuitive way to interact within the context and convenience of your customers’ lives. They can reach you more easily and they don’t have to traverse your website to contact your brand. Opening your brand’s line of communication can have a positive effect on your support’s resolution time, customer satisfaction, and conversion rates. When customers can speak with an agent and have their questions answered within minutes, satisfaction rises. In fact, 92% of chats receive a positive CSAT score. And when customers are happy, they’re more likely to make a purchase with your brand. Reaching out in real-time can increase sales by up to 29%. Our innovative approach provides businesses context-specific tools to keep their customers consistently engaged, wherever they are, whenever. You can also integrate Chat and Message into the Zendesk product family so agents can switch between serving chats, phone calls, emails. Live chat and messaging are a fast and effective way to offer help and an even better way to create a personal connection with customers—it’s proactive messaging for the next generation of consumers. You can learn more about Zendesk Chat and our new Enterprise plan here. To stay up to date on new features and announcements, check in here.